Explaining whether you are a shower person or a bathtub person is much like explaining whether you are a dog person or a cat person. It is largely a matter of personal taste. But when you are deciding whether you want a shower or a bathtub in your most personal space, there are several factors to consider. In this article, we will explain the differences between the two choices. The process of installing a new shower or bathtub begins with the removal of the old fixture. This difficulty, the plumbing changes, and other considerations make this a job for a professional. The size of a new tub or prefabricated shower makes a big difference in the difficulty of the installation. 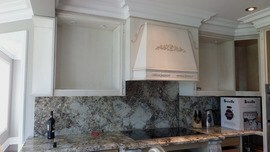 A strong consideration is the clearance needed to move the new fixture through the home to the bathroom. This is why prefab showers and bathtubs are installed in new construction so early in the process. They are often put in before the drywall 1 and certainly before other bathroom fixtures. Depending on the size of the bathroom, the sink and toilet may also need to be removed before the tub or shower replacement and reinstalled afterward. Installing prefabricated showers and standard bathtubs are similar processes. After the plumbing is prepared, the flooring below the fixture is repaired and strengthened if necessary. The drain plumbing is connected, and the tub is secured or the shower pan 2 is installed. For a shower, the shower stall itself is then put in. The remaining plumbing and fixtures are connected, and the finishing touches are completed. A custom shower installation is much more involved and requires the skills of a carpenter, plumber, and tile craftsman. 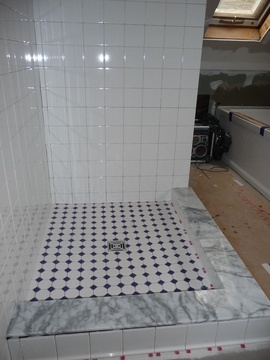 The carpenter will need to prepare the space, the plumber will connect the new shower materials, and the tile craftsman will complete the installation. The same professionals will be needed for the installation of a soaker or whirlpool tub. In this case, the detailed work comes after the tub is installed. Unless the bathtub is free standing, a carpenter and a tile mason will build and finish the backsplash 3 and the tub surroundings. 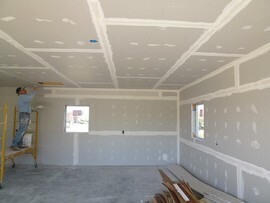 In conclusion, the difficulty of the installation depends on the choices of the homeowner. A standard tub installation will be more difficult than a standard shower. However, custom installations will vary according to the features selected. An average-sized and average-quality prefabricated shower will cost approximately $450 to $480 for materials. Labor to install the unit will be $365 to $450. This total of $815 to $930 is the least expensive way to go when installing a shower. For a more custom shower using tile and glass doors, the material cost will increase to $1,600. The labor will increase to between $4,800 to $5,400, including a carpenter, plumber, and drywall 1 specialist. The total cost for this basic custom shower will be approximately $6,400 to $7,000. Many options are available to customize your shower experience including rain shower heads, multi-functional jets, and steam. If any of these more luxurious features are chosen, the overall cost can increase to $10,000 or more. Replacing a tub with another standard tub will cost approximately $500 to $1,100 for materials. To install this tub, the cost will be between $600 to $700, for a total of $1,100 to $1,800 for a basic tub replacement. If replacing a tub with a larger soaker or jet tub, the materials cost will be approximately $1,500 or more. An electrician will be added to the list of professionals if installing a jetted or whirlpool bath. This will add another $140 to the installation bill for a total of at least $2,815. Additional tilework or masonry work necessary for a tub with a backsplash 3 and tub surroundings will add even more, driving the cost to $5,000 or more. There is no simple answer to the question of which is more energy and cost efficient, a shower or a bathtub. An average bathtub holds between 25 and 40 gallons of water, but the typical bath is about 30 gallons, allowing for the body’s displacement of water. A 10-minute shower with a new low-flow showerhead, by contrast, will use about 20 gallons of water. This means a lower water and energy bill at the end of the month if a standard shower is compared to a standard bath. However, long, hot showers or the added feature of dual shower heads can double the water consumption, driving water and energy bills even higher for showers than standard baths. A soaker or whirlpool bath can use 80 to even 100 gallons of water to fill, possibly necessitating a larger capacity water heater. A bathtub is almost a necessity in homes with small children because parents will want a tub to bathe the child rather than a shower. On the other hand, both seniors and people who have limited mobility can have difficulty stepping into and out of a bathtub. However, showers, especially those featuring grab bars, a non-slip surface, and a seat, are preferred by many who have mobility issues. A bathtub uses more space in a bathroom. The average bathroom is just 5 feet x 8 feet. This means space is at a premium. A standard tub is 30 inches wide and as long as 72 inches. Showers average from 36 inches x 36 inches to 36 inches x 48 inches. Even larger, higher-end showers can add the feeling of luxury to a bathroom, even using double shower heads or a seat, while still maintaining a smaller footprint than a bathtub. 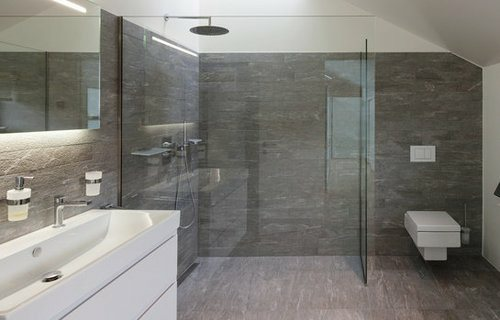 In a small bathroom, a shower can be a solution to space limitations since it can take up less space than a tub. Many sizes and designs of bathtubs are available, even free-standing units that can go almost anywhere. A bathtub, finished with the right fixtures and materials, can add a style statement to any bathroom. A luxurious shower can be the focal point of the bath also, especially one with glass doors and even glass walls. Either a shower or bathtub can elevate the style of any bathroom. Running a tub with hot water and bathing are not as quick an option as a shower. Many people lead busy lives and want to hop in and out of the shower in order to move on with their plans. Most people realize that a hot bath is a great tonic for sore muscles. Special features of bathtubs are available including air jets and whirlpool options that help even more. What some of us don’t know is that a variety of additives to bath water are claimed to have health benefits: green tea for anti-aging, detox, and balance; gelatin for hydration, mood elevation, and skin softening; and epsom salts for pain relief, relaxation, and reduced inflammation. Showers can be beneficial as well. Hot showers can soothe sore muscles, open sinuses, and raise oxytocin levels to relieve stress. Cold or cool showers may relieve depression, ease exhaustion, and hydrate our skin and hair. 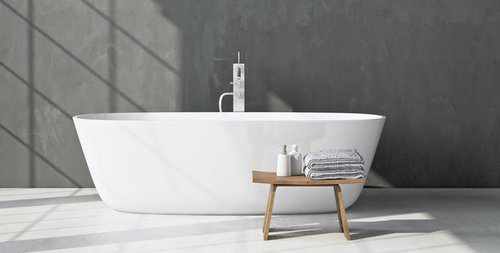 As inviting and stylish as a luxurious shower can be, at least one bathtub in the home is important to buyers, something to keep in mind for the future. Having only a shower in a home will not necessarily lower the home’s value, but it could mean waiting longer for a sale. This may not be true if the home is in an area mostly populated by people without young families. If in doubt, consult a local realtor for the best advice. In addition, a National Association of Home Builders survey of the most unwanted features in a home showed that 51 percent of home buyers said they did not want a home with only a shower in the master bath. Therefore, you should carefully consider a remodel that will eliminate a home’s bathtub. How much does it cost to install a shower or a bathtub in my city? Cost to install a shower or a bathtub varies greatly by region (and even by zip code). To get free estimates from local contractors, please indicate yours.